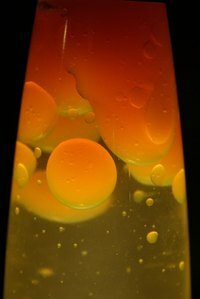 The lava lamp is a 1960s invention. Lava lamps consist of a base, usually made of metal, and an incandescent light bulb that provides light and heat. Although the lamp puts off a small amount of light, it is meant more as a novelty than a source of light. The heat from the bulb also melts the wax in the glass globe that sits atop the base. When the wax gets warm enough, it loses some of its density, causing globs of wax to rise and fall in the globe. Eventually the light bulb in your lava lamp will burn out and need to be replaced. Allow the lamp to cool down completely if it has been used recently. Unplug the lamp’s power cord from the wall outlet. Lift the glass globe from the lava lamp and place it in a safe location where it will not fall over and break. Reach into the base of the lamp and unscrew the bulb in a counterclockwise direction. Make sure your replacement bulb is the same size and wattage as the old bulb. Screw the replacement bulb into the lamp base in a clockwise direction. Carefully place the glass globe back onto the base. Modern lava lamps may take a halogen bulb. Check the label inside the lamp base for bulb wattage, type and replacement instructions. Don't leave your lava lamp on for more than eight to 10 hours. Otherwise, too much heat may be generated and reduce the life of the globe. Check the owner's guide for your lamp for specific instructions. Do not move or shake the globe while the lamp is on and the wax is moving. This could cause the solution inside your globe to become permanently cloudy. Do not try to open your lava lamp globe or replace the solution inside or you could cause permanent damage to your lamp.